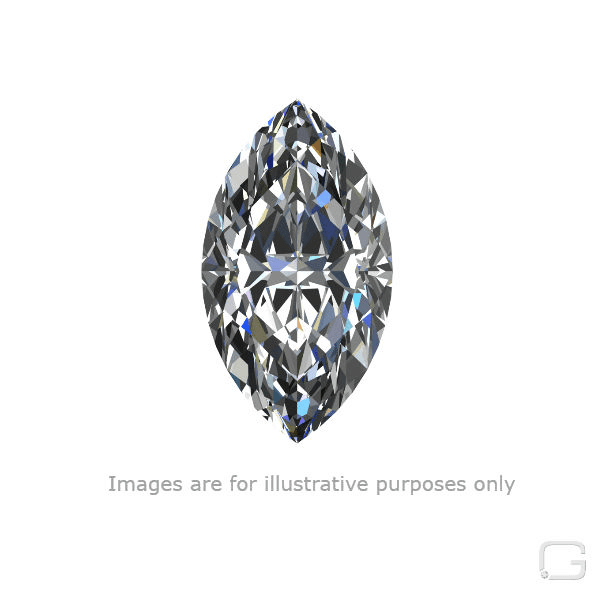 This Marquise diamond is 0.62 carat in weight, and comes with Good polish and Fair symmetry, as verified from an independent gemological laboratory. The diamond is graded F in colour, and has a clarity grade of SI2. The diamond's GIA grading report number is 1192203058, which will detail further its specifications and measurements, and will also come with the purchase of the stone. AUD 6,596 Excl. Duties / Taxes. This Marquise diamond is 1.55 carat in weight, and comes with Very Good polish and Very Good symmetry, as verified from an independent gemological laboratory. The diamond is graded L in colour, and has a clarity grade of VVS2. The diamond's GIA grading report number is 2171291801, which will detail further its specifications and measurements, and will also come with the purchase of the stone. AUD 3,447 Excl. Duties / Taxes. This Marquise diamond is 0.83 carat in weight, and comes with Excellent polish and Very Good symmetry, as verified from an independent gemological laboratory. The diamond is graded H in colour, and has a clarity grade of VS1. The diamond's GIA grading report number is 2297142398, which will detail further its specifications and measurements, and will also come with the purchase of the stone. AUD 4,118 Excl. Duties / Taxes. This Marquise diamond is 0.72 carat in weight, and comes with Excellent polish and Excellent symmetry, as verified from an independent gemological laboratory. The diamond is graded E in colour, and has a clarity grade of IF. The diamond's GIA grading report number is 6312863254, which will detail further its specifications and measurements, and will also come with the purchase of the stone. AUD 1,824 Excl. Duties / Taxes. This Marquise diamond is 0.5 carat in weight, and comes with Excellent polish and Very Good symmetry, as verified from an independent gemological laboratory. The diamond is graded E in colour, and has a clarity grade of SI1. The diamond's GIA grading report number is 5256512758, which will detail further its specifications and measurements, and will also come with the purchase of the stone. This Marquise diamond is 0.46 carat in weight, and comes with Good polish and Good symmetry, as verified from an independent gemological laboratory. The diamond is graded K in colour, and has a clarity grade of SI2. The diamond's GIA grading report number is 5192284433, which will detail further its specifications and measurements, and will also come with the purchase of the stone. AUD 1,051 Excl. Duties / Taxes. This Marquise diamond is 0.3 carat in weight, and comes with Very Good polish and Very Good symmetry, as verified from an independent gemological laboratory. The diamond is graded D in colour, and has a clarity grade of SI1. The diamond's GIA grading report number is 6302452140, which will detail further its specifications and measurements, and will also come with the purchase of the stone. This Marquise diamond is 0.31 carat in weight, and comes with Very Good polish and Very Good symmetry, as verified from an independent gemological laboratory. The diamond is graded F in colour, and has a clarity grade of VS2. The diamond's GIA grading report number is 6292644221, which will detail further its specifications and measurements, and will also come with the purchase of the stone.